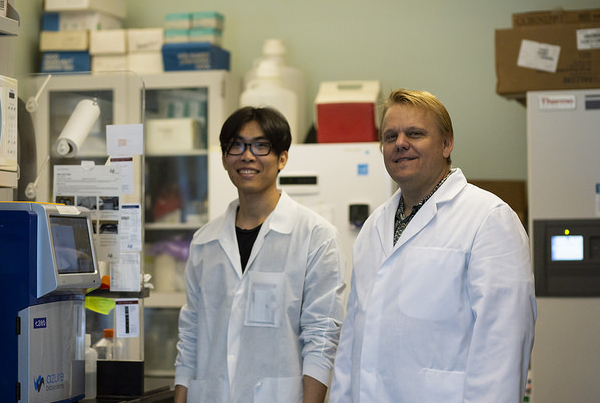 Pictured: Dr. Axel Lehrer with graduate student and paper co-author Albert To in the Lehrer Lab, Nov. 2018. Deborah Manog Dimaya photo. Dr. Lehrer thinks the vaccine his team proposes might be safer that other candidate vaccines, especially keeping in mind that pregnant women constitute a significant part of the target population for a Zika vaccine. 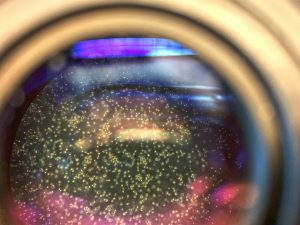 Researchers led by Dr. Alex Lehrer at the University of Hawaiʻi (UH) medical school have successfully developed a vaccine candidate for the Zika virus, showing that it is effective in protecting both mice and now monkeys from the infection. Demonstrating the effectiveness of the vaccine candidate in monkeys (non-human primates) is an important milestone because it typically predicts the vaccine will work in humans, enabling further clinical development. Insect cells as seen through a microscope. Deborah Manog Dimaya photo. The proposed vaccine reported by scientists at the UH John A. Burns School of Medicine (JABSOM) in the journals Frontiers in Immunology and mSphere, an open access journal of the American Society for Microbiology, is a recombinant subunit vaccine that uses only a small part (protein) of the Zika virus, produced in insect cells. 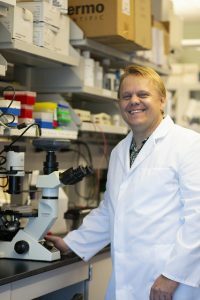 “We believe our vaccine candidate shows much promise particularly as it showed to require only two immunizations given three weeks apart and is a potentially safer alternative to other candidates already in clinical trials,” said Dr. Axel Lehrer, JABSOM (Assistant) Professor of Tropical Medicine and Infectious Disease. Lehrer thinks the vaccine his team proposes might be safer that other candidate vaccines, especially keeping in mind that pregnant women constitute a significant part of the target population for a Zika vaccine. Honolulu-based Hawai’i Biotech is a key partner in the vaccine development project with UH. Two of their scientists, Dr. Jaime Horton and David Clements, contributed to the most recent publication demonstrating vaccine efficacy in monkeys, along with collaborators from Bioqual Inc. of Rockville, Maryland, and the Department of Diagnostic Medicine/Pathobiology, Biosecurity Research Institute, College of Veterinary Medicine, at Kansas State University. Dr. Axel Lehrer in his laboratory at UH-JABSOM. Photo by Deborah Manog Dimaya, Nov. 2018. Dr. Lehrer with graduate student and research co-author Liana Medina at JABSOM in 2016. Tina Shelton photo.